I think what I love about the stoner rock scene is the breadth of sounds that it represents. While you definitely have the traditional stoner records you also have albums that come across as doomier. Other records might have a goth vibe. Then you have albums like Darker Seas an album that perfectly encapsulates the late 70s style of bands like Thin Lizzy or even Rainbow. Replete with guitar histrionics, powerful vocals and exciting songwriting, this is a rock album that you can't help but to love. What gets me about Darker Seas is the sheer quality of the songs. There are huge choruses here and great guitar playing. More than that though the singing is absolutely phenomenal. The tasteful playing can't help but to mesmerize the listener and the deeper that i delve into the works of tracks like The Fall the harder it becomes to extricate myself. On Darker Seas Ape Machine do a phenomenal job of playing with dynamics and textures. The pummeling assault of some of these things leaves you with a smile on your face but others can leave you with a heavy heart and that's all part of what makes them so good. There is a strange sense of poetry that dominates this record. 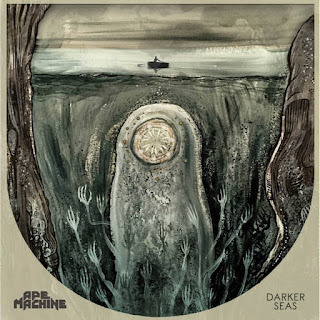 It comes from the simple fact that Ape Machine perfectly understand the seventies aesthetic which they are trying to capture whilst infusing it with a profoundly modern take on the music. There is a very real beauty to these songs and the approach fuses a variety of interesting ideas. There are some fascinating musical departures for the band like violin driven Nocturne in D Flat (The Jester) slammed right next to straight rippers (The Contract) if you can't dig into that, this might not be your genre.